Contemporary home builders started giving houses a “modern” look in the 1920s. The signature style comes from design elements that value function over form. 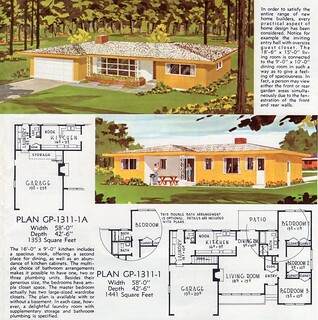 An example of a retro contemporary home is the sitcom dwelling of “The Brady Bunch.” Styles that are also considered contemporary are Art Deco, which celebrated geometric shapes and sleek lines, and the ranch-style house that first became popular in the 1950s. When it comes to today’s contemporary homes, Portland residents find houses with gracious floor plans that adapt to their lifestyles. Contemporary home builders get their inspiration from Scandinavian modern design and the German Bauhaus School of Design. Along with strong geometric shapes, contemporary homes have asymmetrical elements for visual impact, like a modern-style staircase along the back wall of a room. The higher ceilings make space for ample vertical storage and large windows allow for a flood of natural light. The finishes in contemporary homes are smooth, glossy and polished, and include materials like linoleum, concrete or granite for the floors. Decorative accents and kitchen hardware are generally chrome or stainless steel. It is also common for kitchens to have cabinetry with a lacquered look. The color schemes in contemporary homes are neutral and the walls tend to be white. The muted colors enable homeowners to let their furniture arrangements, fixtures or accent items take center stage. H. Hudson Homes is a Portland expert in the contemporary home building field. This team of home builders prides themselves on quality construction and building homes with cutting-edge design, perfect for entertaining and family life.